A central retinal vein occlusion is an unfortunate condition affecting the main vessels in the retina. Only one central vein drains all the blood from the retina. At the point where this vein leaves the eye, it shares a common wall with the central retinal artery. The vein may become blocked in a number of ways. Because of its close adoration with the artery, the vein may become occluded as a result of any disease affecting the arterial wall. Arteriosclerosis (hardening of the arteries) is the most common cause of central retinal vein occlusion. Other systemic problems that can lead to central retinal vein occlusions are diabetes, high blood pressure, and other blood disorders. Symptoms of central retinal vein occlusion include a profound, painless loss of vision. this vision loss is usually sudden and worsens over a few days. If the occlusion is not evaluated and treated, several problems can develop as a result including glaucoma, optic nerve abnormalities, and localized arterial disease in the retina. There are two common complications from central retinal vein occlusion. Growth of new blood on the surface of the retina can cause hemorrhaging inside the eye if left untreated. Secondly, new blood vessels can form on the colored part of the eye. This condition is called rubeosis and may lead to a painful form of glaucoma and repeated hemorrhages in the eye. Several options are available to treat central retinal vein occlusions. Laser surgery may be used to redirect the flow of blood from the retina in an attempt to provide a new exit site for the venous blood. 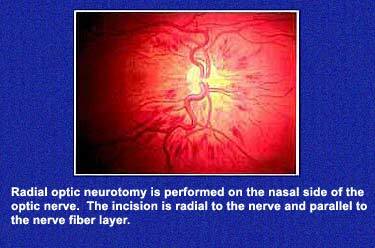 Additionally, a surgical procedure called a radial optic neurotomy may be used to relieve compression on the vein by the artery in the optic nerve. Laser surgery can also be used to prevent rubeosis from developing. Early detection of this condition is essential to treatment to allow maximum medical improvement.